Metadata Technology’s Data Dissemination solutions are designed for Central Banks, International Organisations and National Statistics Offices who need to disseminate official statistics publicly, or to targeted audiences such as statisticians and data scientists. 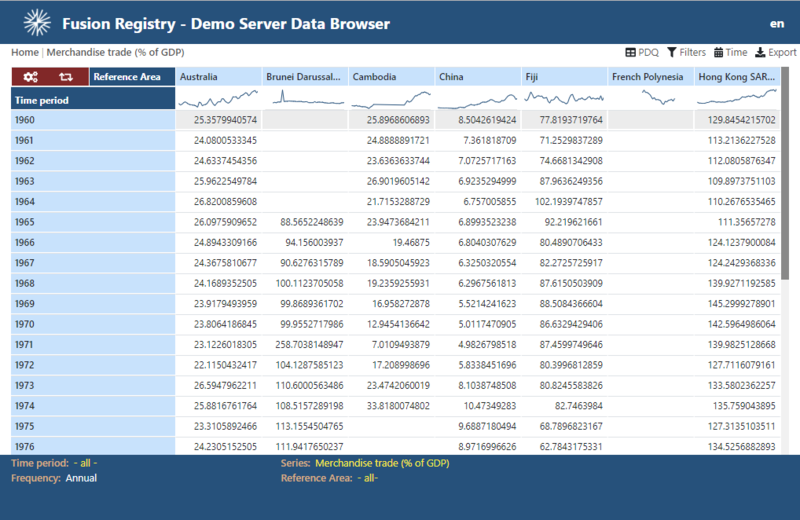 Fusion Edge Server is Fusion Registry 9's public official statistics dissemination server. Fusion Edge Servers can be deployed individually, in scalable load balanced clusters in the DMZ or at the perimeter of a content delivery network where they service end-user data requests. The data for dissemination together with the supporting metadata are pushed to the Edge Servers from a private Fusion Registry 9 Enterprise Edition environment. Once primed with data, the Edge Servers then operate autonomously, requiring no direct communication with internal networks or services which helps to manage security risks. While Fusion Registry 9 servers can be used for dissemination, for public dissemination use cases we recommend using Fusion Edge Servers to provide the end-user interface. This approach avoids publicly exposing production Fusion Registry 9 environments. A Fusion Edge Server is a single Java web application making it simple to deploy. The data and metadata content are stored in its own internal in-memory database persisted to the file system so it requires no supporting database services. Fusion Edge Servers provide a REST SDMX API which can be used directly to provide a public API service, to drive data explorer and visualisation web apps like Metadata Technology's Web Data Browser, or as a data source for interactive dashboards like Google Data Studio. The Fusion Data Browser is a multi-lingual web application for searching, exploring, visualising and exporting datasets from Fusion Registry 9's Virtual Data Repository - a single unified view of all registered datasets integrated in real time from multiple data sources. The Data Browser is suitable for casual data consumers. It is also suitable for statistians and analysts who need an efficient tool to explore, select and export series for further analysis. a breakdown of datasets by category (if categories have been defined in the metadata). Selected series can be visualised as charts or interactive pivot tables, and downloaded in SDMX-ML (XML), EDI, Excel or CSV. You can try it out on the Enterprise Edition live demo server . Both Fusion Registry 9 and Fusion Edge Server provide an SDMX Data REST API suitable for data dissemination. The data can be returned in a variety for formats including SDMX (SDMX-ML, SDMX-JSON and EDI), Excel and CSV. The SDMX-JSON dataset includes support for reporting metrics and supplying information on what data is available based on a specific data query. This information can be obtained by supplying an additional includeMetrics=true parameter. There's more detail on the SDMX Data REST API in the Web Services API Reference Guide. IM-JS provides web developers with a simple but comprehensive API for querying and manipulating the data and structural metadata from a Fusion Registry 9 server, without needing to understand the details of SDMX. IM-JS interfaces to the server side using the SDMX REST API meaning that applications using it will work both directly with a Fusion Registry 9 server, and with Fusion Edge Servers. There's more detail in the IM-JS Documentation. 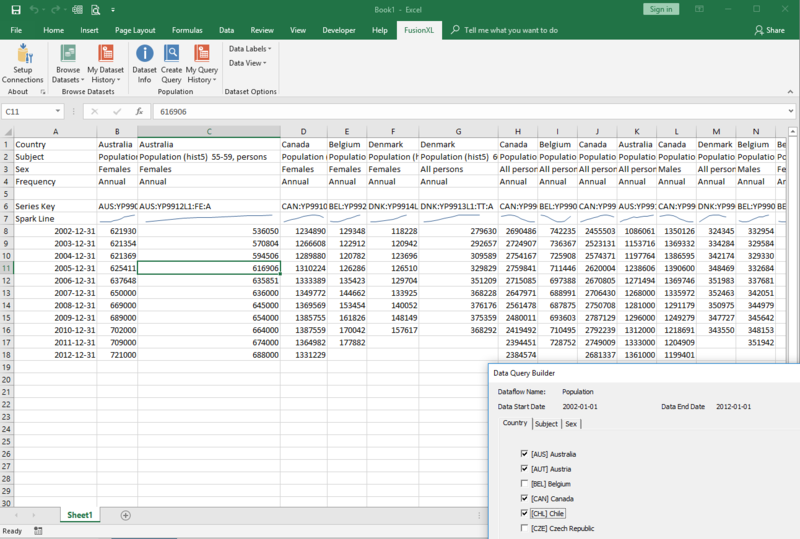 Metadata Technology's FusionXL addin for Excel establishes an online connection to a Fusion Registry 9 service allowing users to browse the available data sets and extract selected data directly into spreadsheets. Register for the SDMX Community Tools, download FusionXL and install. Click on the Setup Connections control in the Excel Ribbon Bar and enter https://demo.metadatatechnology.com/FusionRegistry in the 'URL 1' box. Check the 'Connected' radio button next to URL 1, and choose the OK button. FusionXL should now create an online connection to the live demo server. Choose the Browse Datasets control in the Ribbon Bar to explore the available datasets. FusionXL also supports the authoring and editing of observation data and structural metadata. There's more about using FusionXL for data authoring under the Data Reporting section, and the SDMX Structural Metadata Management section for maintaining structural metadata. 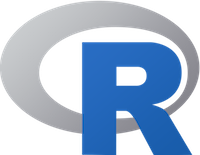 Fusion Registry 9 can act as a robust source of time-series data for statisticians and data scientists wanting to use industry standard statistical tools for analysis and research. Fusion Registry 9 is compatible with free-ro-use SDMX connectors for 'R', SAS, MATLAB and STATA which can be downloaded from https://github.com/amattioc/SDMX/wiki. Metadata Technology’s beta release connector for Google Data Studio allows anyone to create interactive dashboards and visualisations using live dissemination data served from Fusion Registry 9. Google Data Studio is free to use and available to anyone who has a Google cloud services account (Gmail for instance). The report designer tool provides an easy way to create dashboards and visualisations that can be shared with a public or restricted audience using unique links, or embedded in web sites. Google Data Studio provides a comprehensive set of visualisation components that can be used to build dashboards including line and bar charts, data tables, pivot tables, maps and score cards which are useful for displaying key indicators.